Embark on an exciting adventure with the Skylanders and Swap Force using the Skylanders Swap Force Starter Pack for the Nintendo Wii! For generations, the Swap Force protected the volcano that replenishes Skylands' magic. That is, until an epic battle caught them in an eruption that blasted them apart, sent them to Earth and gave them the ability swap powers. Only you can mix and match their tops and bottoms, put them on the Swap Force Portal of Power and help save Skylands! 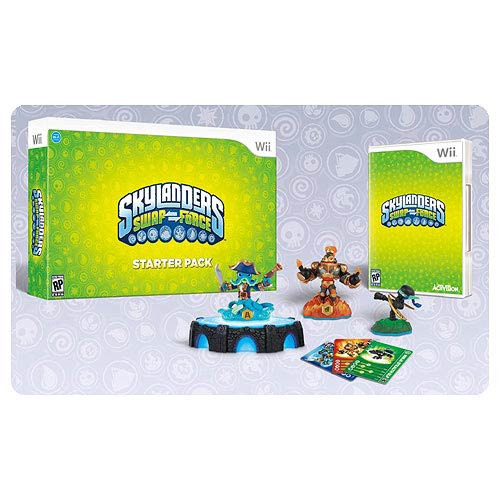 Nintendo Wii Starter Pack includes: Skylanders Video Game for Nintendo Wii, Portal of Power, 3 Skylanders Figures, a Character Collector Poster, 3 Sticker Sheets with Secret Codes, and 3 Trading Cards.